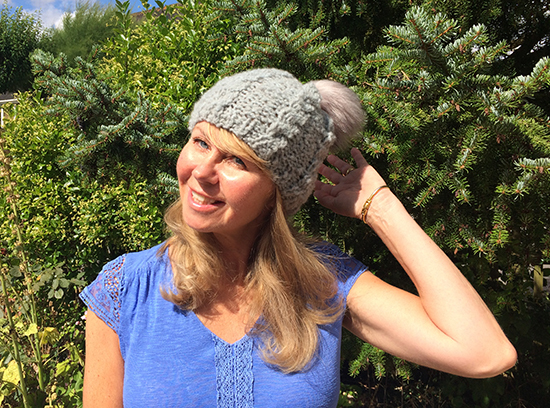 It seems crazy to our non-knitting, non-crocheting friends when in the middle of summer and even during a heatwave we begin knitting or crocheting cosy hats and scarves. 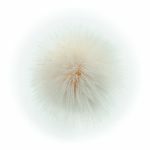 I have just been doing that with a ball of Rowan Selects Cosy Merino yarn that Rowan sent me despite the 30° C heat! 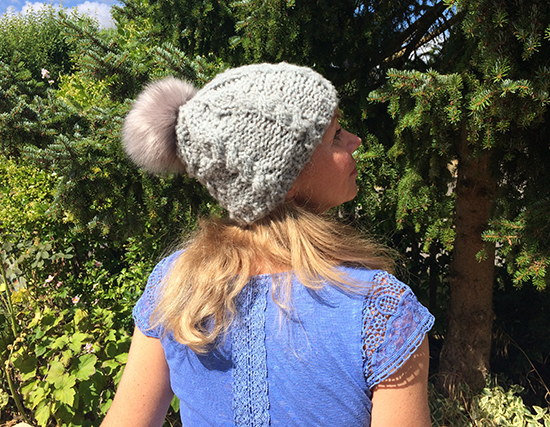 And here it is all finished: a cabled beanie with a cute fluffy pompom! 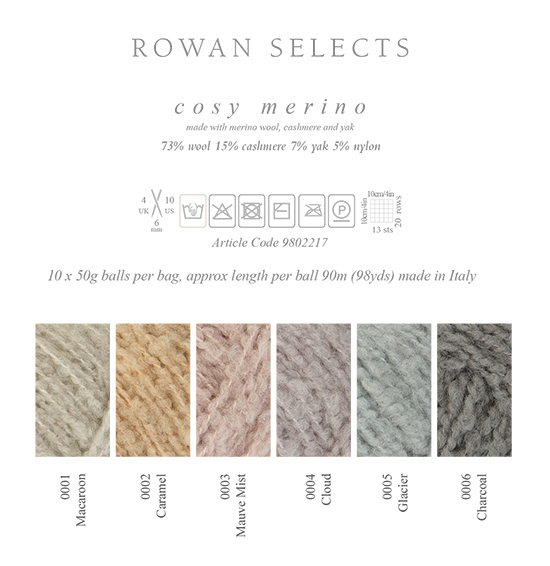 Cosy Merino yarn is part of Rowan’s Selects yarns and has just been released. 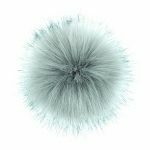 These Selects yarns are limited edition yarns that Rowan release every season and they are only available for a limited time. They produce a certain amount and then when it’s all gone, it’s gone…that’s it…no more. 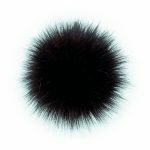 So if you are knitting up things to give away as gifts for Christmas or the Holiday season and want something that is quick to knit, cosy, squishable and with free pattern support you may want to get your hands on some of this yarn. My beanie only took me a few hours to knit! 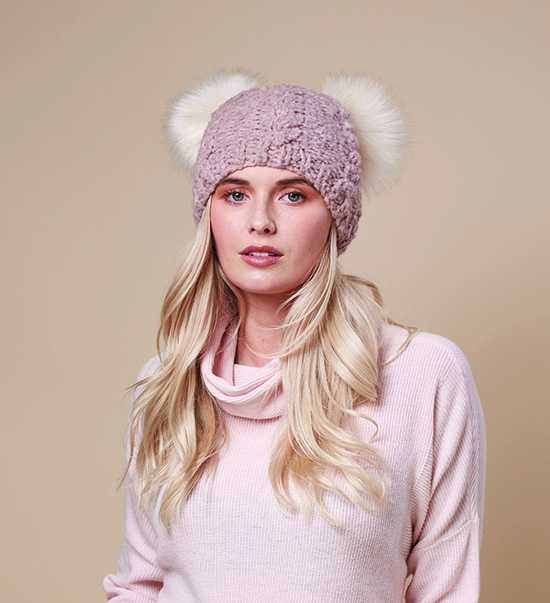 This blend of cashmere and yak apparently will create less static so the knitted fabric is less likely to cling to your body or clothes….something I didn’t know about cashmere and yak fibres! 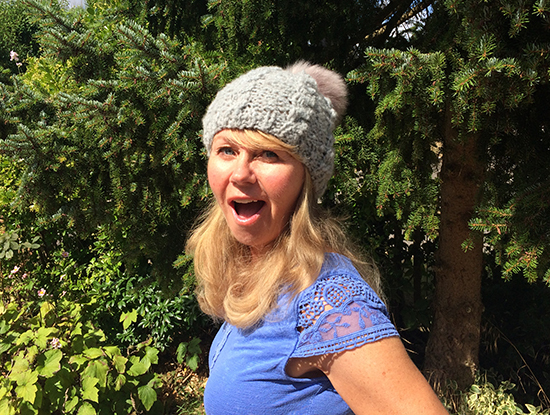 My knitted hat seems to be very light and the fabric is springy and lofty. 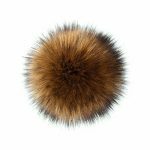 It is indeed soft and does not feel scratchy on the sensitive skin around my neck. 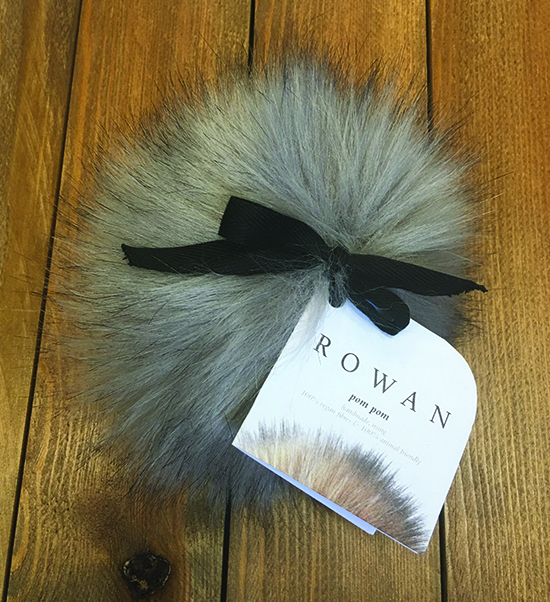 I received the shade Glacier and Cloud from Rowan but it does come in six shades in total…. 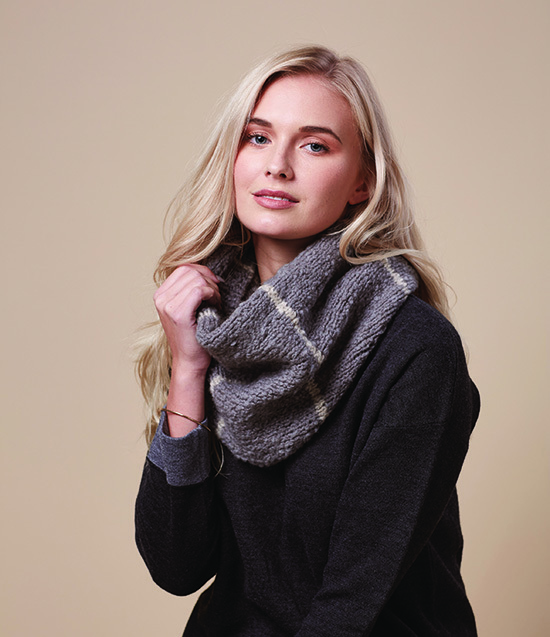 As I mentioned earlier there are some free patterns available to download from the Rowan website: 2 beanies, 2 snoods, a scarf and a wrap, all designed by Quail Studio. 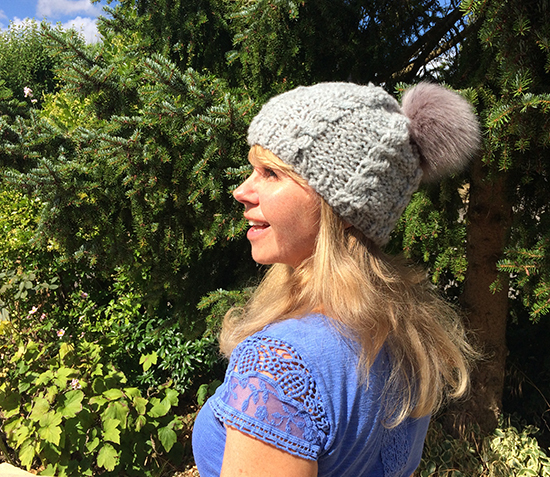 Here’s the photo from the pattern of the cabled beanie I made. 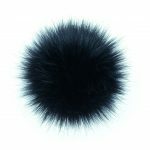 i only had one pom pom but I think I would’ve only used one anyway. 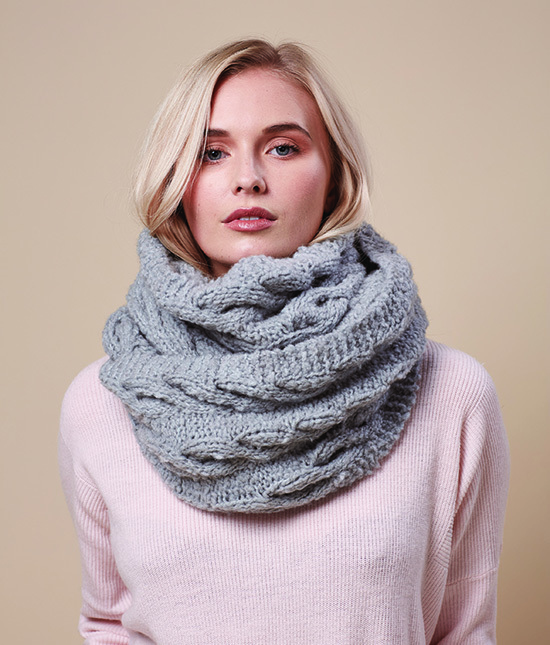 I also do like the idea of knitting up a snood and I might have a go at the Striped Snood…. 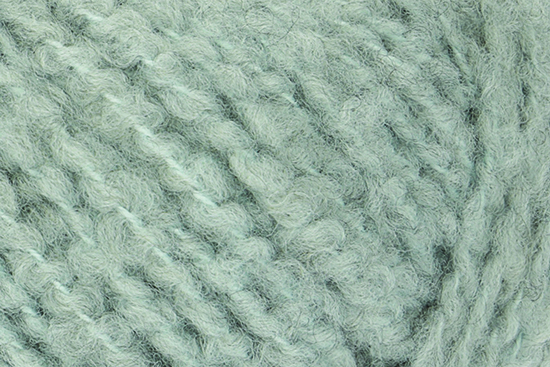 Or maybe the cabled scarf to go with my cabled beanie….. But I would need to decide pretty quickly and buy the yarn before it’s all gone. …..so you only need to buy one. Swop them from hat to hat. They also don’t appear to become misshaped when crushed. I’ve had mine for a while now but it got squashed in some packaging and transported in a container all the way from the USA to the UK. After six months of squashing, I took it out, gave it a shake and it’s just like new. From left to right: Cream; Fox Camel; Fox Coffee; Fox Steel Grey; Fox Black. 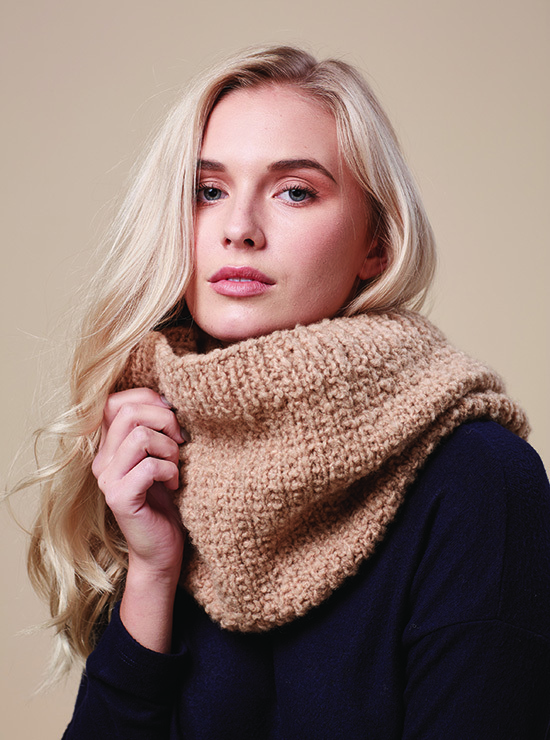 So, if you think you might like to knit up one of these Cosy Merino accessories be quick because this yarn will not be around for too long.